I trained as a fine artist and painting continues to be my main focus. However, three years ago I became fascinated by Photoshop's creative possibilities when restoring some family photographs. Having also worked in traditional printmaking, I found the creation of original digitally generated prints far more exciting and more practical - like having a fully equipped printmaking studio in one small box. I have a passion for Italy: Venice, Commedia del Arte, ancient Roman art. I also love English medieval carving and surrealist painting. I take ideas from life and the imagination, mythology, music and from particularly evocative reading. My pictures are a personal narrative which, though not directly inspired by dreams, may have the atmosphere of a dream. What photoshop tools do you use most and what for? The eraser tool for all sorts of things: to soften edges, add subtle transparencies and for selections. I avoid hard outlines by making a rough selection with one of the Lasso tools, then refine with a soft eraser brush. Dodge and Burn tools are incredibly useful for detailed tonal adjustments, and of course the Brush tool for direct on-screen painting. Is there anything you'd like to learn to do? I haven't mastered the pen tool, though my dislike of hard-edged selections means that its use is not crucial. Displacement maps is another area I have neglected, but must learn. I use Photoshop very instinctively, finding different methods to make each image rather than using text-book techniques. Having said that, I have picked up numerous hot tips from Photoshop Creative! What's you're favourite Photoshopped image you've created and why? 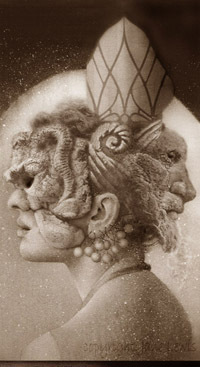 One of my favourites is "Janus", because it was my first successful image created in Photoshop. I created it before buying a graphics tablet, and can't imagine doing that much work with the mouse now! A scanned drawing was completely transformed by textures and digitally drawn detail. Janus was the Etruscan/Roman god of doorways and of all beginnings. What advice can you give to readers learning Photoshop? Don't be afraid to experiment and make mistakes. One of the glories of Photoshop is the ability to work in layers and return to earlier states at any time. Facilitate your ability to draw and manipulate an image with accuracy by getting a graphics tablet. Textures - either scanned or photographed - can add depth and subtlety to an image.